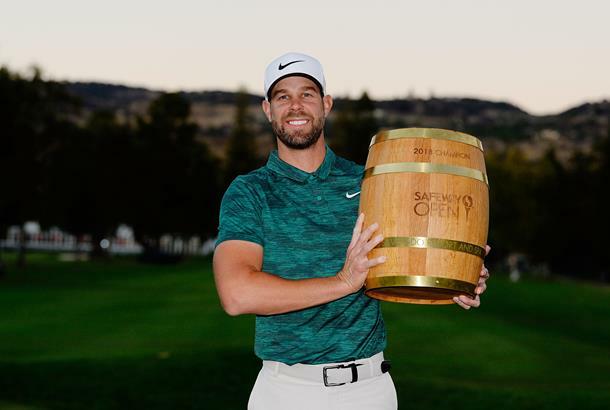 Kevin Tway birdied all three playoff holes in a row to win his first ever PGA Tour title at the Safeway Open, defeating Brandt Snedeker and Ryan Moore in sudden death. Brandt Snedeker held a five shot lead with 11 holes to play but suffered a back-nine collapse which opened the door for Tway and Moore. Three bogeys in a row from the 10th left Snedeker in need of pars over his final two holes to win his second title of the year, but a bogey on the 17th instead left him in a three-way playoff at 14-under-par. Ryan Moore came from 7 shots behind at the start of the day with three birdies in his final four holes, while Tway's back-to-back gains on the final two holes of regulation play matched Moore and Snedeker's total. Snedeker was the first to be eliminated with an opening par, while Moore and Tway swapped birdies for the first two playoff holes. Tway then carded his third birdie in a row to secure his maiden PGA Tour victory. "I’m kind of at a loss for words," he said afterwards. Tway’s father, Bob Tway, also secured his first victory in a playoff 32 years ago at Torrey Pines, making them the 10th father and son Tour winners.